Young Arts volunteers fundraise and give grants to arts projects for children and young people in their local area. In a time of cuts and changes to the national curriculum, this has never been more important. This group of volunteers aims to give more children and young people access to the arts. Working with schools, museums and youth groups, Young Arts volunteers support a wide range of projects. They are passionate about the benefits that creativity and arts education can bring to children in early life and adolescence. In 2016 Young Art forged exciting new links and donated equipment to Stepping Stones School in Hindhead. This is a small school of 60 young people with disabilities ranging from chronic medical conditions such as hemiplegia to emotional problems. Mrs Rosie Laverton, the Head of Art, encourages all her students to take GCSE Art and her classes have maintained an excellent success rate. 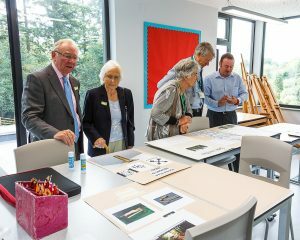 In order to support the exciting work done by Mrs Laverton we have donated four standing easels, for those pupils who find this a preferred method of working. We were fortunate to obtain the preferred easels at a competitive price and we are pleased to announce this to be our first major charitable grant. Young Art is proud to forge an ongoing relationship to a dynamic, specialist school and to work with them in the future especially at this time of their proposed exciting expansion into Undershaw House. 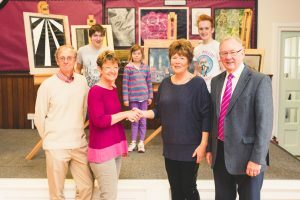 Grayshott DFAS has provided financial support to a pyrography project involving sculpture and stencilling. The project helps pupils develop creative, innovative and effective approaches to the understanding of the arts and also improve their fine motor skills. The Undershaw site provides a great platform for this sculpture and stencilling project as it connects the pupils with the nature and history of the garden of this historically important house. In particular, the Art Department will use the project to develop the Forest School / Fairy Garden that was originally created by Conan Doyle’s wife. The history of the site will be brought back through art utilising felled trees and will include a sculptured totem pole. 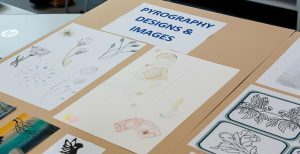 The project will also develop specific artistic and craft skills in pupils related to pyrography, 3D and sculpture. The pupils will be exposed to a wide range of artistic influences through visits to a local sculpture park and through a master class. 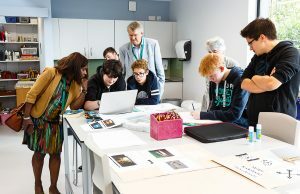 The objective of the project is not only to develop the art related skills of the pupils but to connect them to history and nature, foster positive attitudes and provide an inclusive activity for students with disabilities.